In September 1852 Allen Dodworth opened his Dancing Academy in a new double-wide brownstone structure at Nos. 806 and 808 Broadway. He and his family lived in part of the building while the magnificent Dodworth’s Hall made up the remainder. Dodworth Hall sat directly north of the Grace Church rectory which, like the church, was designed by James Renwick, Jr. The Hall blended in with the nearby mansions—faced in brownstone and designed in the Italianate style. But the northward migration of Manhattan’s wealthy that had prompted Dodworth to erect his exclusive academy here continued on. In 1861 he left Broadway, moving his high-toned hall to Fifth Avenue and 26th Street. The Broadway venue where New York’s upper crust had heard Europe’s finest performers now offered crowds cheap amusements. By the second half of the 1880s the Broadway blocks below Union Square filled with retail stores and shops. The end of the line had come for Dodworth’s Hall. In 1887 the architectural firm of Renwick, Aspinwall & Russell designed a store, office and loft building for the site. Completed the following year, it intentionally melded with the Grace Church complex. Five floors of beige brick sat on a cast iron and brownstone base. Exuberant terra cotta Gothic Revival details, pointed arches and corbels combined in a stately, nearly ecclesiastical structure. The side wall, which would have been blank in nearly any other midblock location in the city, was as decorated as the Broadway façade, forming a romantic northern enclosure for the Grace Church lawn. The building quickly filled with a variety of tenants. On January 1, 1888 Robert K. Davies & Co., importers and manufacturers “of men’s furnishing goods,” moved in. The firm, originally named John M. Davies & Co., had been started around 1850 by John M. Davies, who died in 1871 leaving an estate of more than $1.3 million. When John M. Davies, Jr. died in 1887, the surviving son Robert carried on the business. On April 20, 1890 The New York Times reported on the newly-formed American Book Company. The result of a merger of four of the largest school book publishers in the country—Ivisen, Blakeman & Co., A. S. Barnes & Co., D Appleton & Co. of New York, and Van Antwerp, Bragg & Co. of Cincinnati—it now took space in the Broadway building. Seeger and Guernsey’s Cyclopaedia of the Manufacturers and Products of the City of New York listed the broad array of school supplies also offered by the American Book Company. Included were pen holders, pencils, pen racks, pen moisteners, rubber erasers, rulers, thumb tacks, school writing books, and writing books. Three months before the American Book Company moved in, Robert K. Davies’s business had begun to crumble. His sister-in-law had sued him for her deceased husband’s share of the business, costing the company $127,000. Then he discovered that the business owed his father’s estate $265,000; although Davies insisted to the courts that there was no estate money in the business. A year and one day later, on January 16, 1891, Robert K. Davies suffered a massive heart attack in his home, dying instantly. Other tenants in the building included builder H. T. Ambrose by 1894, and architect William Debus, who would maintain his offices here for several years. In 1900 he was busy designing several Brooklyn tenement houses; and in 1901 designed Brooklyn structures for two other builders who also leased space in the building, Jacob Schauf and Louis Beer. By now the millinery and garment districts had engulfed the area. 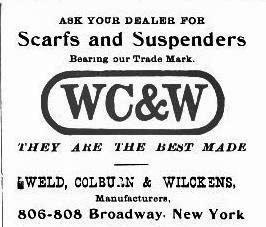 In 1896 Weld, Colburn & Wilckens, makers of scarves and suspenders, was in the building, joined soon by Hill Brothers ladies hat manufacturers. In 1903 Hodgman Rubber Co. moved in. The manufacturer and wholesaler sold “rubber surface clothing, slip-ons,blankets and hospital sheetings, druggist sundries and surgical goods, elastic bands, and coated cloths of all descriptions.” With George F. Hodgman in the firm were his two sons, S. Theodore and Goerge B. Hodgman. When George B. Hodgman’s health began failing in 1906, he and his wife sailed for Europe “in the hope that the change would benefit his health,” according to The New York Times on September 29. The 61-year old businessman died in London on September 28. While Samuel W. Peck garnered a fortune in his boys’ clothing business, his luck was otherwise not as good. He lived with his wife in the smart Ansonia Hotel on Upper Broadway. A quiet night at the theater later turned wild when, on January 18, 1905 their chauffeur, Gustav Swanson, picked them up in their “Victoria automobile” and they headed home. Swanson, it seems, had a heavy accelerator foot. “As they whirled up Broadway beside a big touring car, driven by Leo Trousler,” reported The New York Times the following day, “Bicycle Policeman Bullman of the West Forty-seventh Street Station gave chase.” In 1905 speeding automobiles were easily matched by in-shape bicyclists and Officer Bullman intended to stop the reckless drivers. Peck’s bad luck continued on the night of October 20, 1908 when burglars blew open the safe in his Broadway offices. In order to blow the safe, the thieves used plaster of paris to seal the cracks. In doing so, they spilled the powder on the floor, then walked through it during their escape. In a stunning example of early forensic detective work, the police solved the case. The New York Times later said “it was one of the most daring that the police have had to solve in some time, and bore all the earmarks of a job done by practiced cracksmen. In the meantime, Pesky’s sister screamed and tried to get into the fray. Four policemen had to carry her, kicking and screaming, out of the courtroom. No sooner had Pesky been controlled and sat on a bench, he started another violent attack. Finally, the judge gave up and postponed the hearing until the next day. Two tenants, E. & R. Rosenberg and Al Jacobsen, ran into trouble in 1925. The first was Jacobsen, who ran a men’s clothing store at street level. He was the victim of a brazen robbery of seven overcoats on January 13 that year. Detective Lines jumped out of the police car with his pistol drawn and arrested the man who had thrown the coats into the cab. The driver sped away into the tangle of traffic with the coats in the back seat, leaving his cohort to fend for himself. “Lines’s prisoner had to be beaten into submission,” said The Times. “The penalty” came on the afternoon of July 15. For months union thugs visited non-union shops carrying lead pipes wrapped in newspapers, threatening workers and sometimes stealing garments. Called “visiting committees,” their purpose was to strong arm owners into hiring union workers. But today the visiting committee would go beyond threats. Six armed men entered the offices just after Rueben Rosenberg had left for lunch. Five went directly into the shop area while one held a gun on the telephone operator, Helen Cohen, and warned her not to answer the switchboard. The five men lined up the nine workers—four of them women—against the wall and told them that “resistance would mean death.” Held at gunpoint by two men, the terrified employees watched as the other three produced bottles of sulphuric acid which they poured over high-priced overcoats. The thugs then ran down the stairs and into a waiting automobile. Rosenberg valued the ruined garments at between $60,000 and $100,000. Throughout most of the 20th century the building would continue to attract tenants in the garment trade. 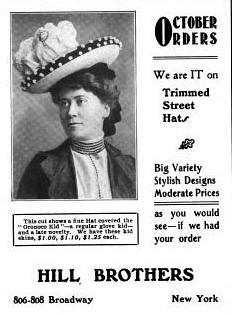 In the 1930s Lubell Bros. Mfg. Co. was here, makers of boys’ shirts. In the 1940s Criterion Shirt Band Co.; Rosenhirsch Company, importers; Spiegel Brothers Corporation; and Eastern Textiles Co. were all in the building. In 1981, as the Noho neighborhood experienced a rebirth, the remarkable building was converted to 69 cooperative residential units. Given the slightly-misleading name The Renwick, its magnificent ivy-covered façade survives as an integral part of the charming Gothic Revival ensemble.